In part 1, we went over the basic building blocks of dialogs: constants and records. We used those building blocks to build a simple unit selection dialog. If you have not read part 1, I suggest you do so now before continuing. In part 2, we're going to cover text styles heavily. I'm going to show how to leverage patch 1.2 to import custom styles, and then I'm going to edit the dialog from part 1 in order to demonstrate that our custom styles worked. Some elements that were planned for this tutorial have been moved back becase there's a lot to cover and this tutorial ran a little long. The map for part 2 will be built on top of the tutorial map from part 1. If you do not already have the tutorial map for part 1, and you want to follow through this tutorial, I suggest you go back to part 1 and download the map attachment now. Text styles control how text is displayed. It controls the font, font size, weight, color, and alignment. With the exception of color, if you want to change any of these text attributes, you're going to need to apply a text style. There are two ways to apply text styles. They can be applied inline through <s> tags, as you may already be aware from using the standard text dialogs. You can also apply a text style to a dialog item, using the "Set Dialog Item Style" function. Whenever possible, apply the text style to dialog item instead of using inline styles. Why? Inline styles ignore text alignment. You can't center text if it's part of a paragraph, so inline styles just ignore this information and use the rest of the style information. One of the most common questions I run into regarding dialogs: "I can't get my text to center. Why is that?" You can center text, but you can't do it with inline styles. You need to apply the style to the dialog item itself. You can still use inline styles to vary text within a single dialog item. However, if you want all of the text to be centered (or bottom aligned, or any kind of alignment besides default), you're still going to need to apply a style to the dialog item. If you've been using styles for a while, then you know what a pain it can be to find a specific style you want. If you haven't been using them, just know that it's a pain, but I'm not going to cover it. Instead, I'm going to recommend another way that requires some initial work to be done, but will be much easier in the long run. Patch 1.2 gave us the ability to (finally) create custom styles. This ability is so cool and so useful, I'm not even going to show you how to do it the other way. Previously, we were forced to use only the styles that came with the game. With this came the burden of trying to find a style that was just right. It was a pain, it was frustrating, but we don't have to do it any more. We can now create custom styles, so I suggest you do so. You will gain a great deal of flexibility as a result. I wish I could tell you that creating custom styles was super easy, but it's not. It is fairly easy, but it's not as easy as it could be, and it requires a little initial leg work. To create custom styles, we're going to need to create our own .SC2Style file. The first section of the file is just a large comment block where they were nice enough to lay out all the style elements that can be defined. This will be useful to us later. After that is a large group of constants. First, the fonts are defined as constants, then a few font sizes, then a whole bunch of colors. You can use these constants in your own custom styles. Finally, it defines a few style templates. If you scroll through the file, you will notice that most (if not all) styles derive from these templates either directly or indirectly. When we build our styles, we will do the same. Personally, all of the custom styles I've built in the past have derived from either StandardExtendedTemplate (a fairly normal font) or HeaderExtendedTemplate (a bold font). It's also worth noting that you can build your own templates, which you can see demonstrated a number of times throughout this file. Feel free to expand on this is you see fit, but we're going to stick with this for now. Whatever you arrive at, save the file as customstyles.sc2style, somewhere that you can find it again. Import the sc2style file just like you would any other file. Hit F9 to open the Import window. Right click on the left panel and select "Import Files...". Find the folder you saved your sc2style file in, and make sure only that file is checked. You can give it a path if you want, but I just put it in the root personally. There's only going to be one. Hit OK, then save your map. Importing doesn't actually happen until you save your map. There's one final step to adding custom styles to your map, in data. Open the data type Game UI Data. There's probably only two objects here, the one you want is "Default SC2 UI Settings". Edit the field "UI - Font Style Files" and add a new one, finding your customstyles.sc2style file. Now you should be able to use your styles. Save once more, just to be sure. So now that we've imported our custom style, we want to test it. Currently, however, our dialog (from part 1) doesn't show any text. That's not a big deal. Let's use this opportunity to show how flexible our dialog really is. Will it be difficult to add a header to our dialog? Not at all. If we're going to add a header to our dialog, we'll need two more constants. First, we'll need the size (height) of the header line iteself. Then, we'll need to know how big the gap between that line and the rest of the dialog items will be. We already have a gap constant, I am aware. But we may find that this gap needs to be a different size than the gap between buttons. Remember one thing about constants: if you have two constants, but you really just need them to be the same, it's no big deal. You can set one to equal the other. However, if you have one constant, but you really want there to be two, it can be much harder to break apart. We are going to err on the side of caution and just add another constant, even though it's probably going to end up being the same as our other gap. So for the header height, we know that our header font size is 20. So I'm going to use 24 to give a little extra room. For the row gap, I'm going to use 4 (the same as the button gap). Remember, I don't have to spend a long time dwelling over picking the right number, because I can change it easily. I just need to try something, and if it doesn't work I'll try something else. Now let's open up our "Unit Selection Dialog - Create" action. You may have already considered that we're going to need to recalculate a few things. Specifically, our dialog height is no longer correct. Also, we need the buttons to be drawn lower on the dialog. We're also going to need to do a simple calculation for our header width. That's right, another Arithmatic Multiple (Integer). I'm a big fan. (I changed cDialog Border back to 40, and cButton Gap back to 4). So we really just gave ourselves enough room for our header, just by recalculating two values. That was pretty easy, wasn't it? This variable must be defined after Dialog Width, because it references it. Although, upon seeing this, I kind of wish the font was a little larger. So we're actually going to do that, because it's a good exercise. It's at this point that I realize that I accidently set HeaderText to the standard template rather than the header template like I said. Still, it's still important to demonstrate how to update a custom style. We'll fix the typo now instead of me fixing it in my post. Anyways, I'd still like to make it a little larger, so we can do that now as well. I tried a few values before arriving at 24. Feel free to experiment yourself. After each change, however, you need to reimport the file and save. When you change the font size, you'll also need to change cHeader Height. Let's keep with the theme of having it be 4 larger than the font size, and make it 28. I hope you never know what it's like to have to search through FontStyles.sc2style (http://www.sc2mapster.com/api-docs/game-files/layout/font-styles-sc2style/) searching for a style that meets your needs. I hope that I have given you the tools so that you never need to do that. Instead, you should be able to wield your own sc2style files to meet your own needs. Also, I hope that editing the dialog helped reinforce our use of constants and variables. Logistically, moving dialog items seems very difficult (and it can be, if the dialog is poorly planned). However, good planning allowed us to do so quite easily. Is it possible to change the font and size of a dialog label if it's an integer value (via convert integer to text)? Absolutely. Once you convert it to text, its not really an integer value anyways. It's now text. You can do anything to it that you can do to any other text. Just want to say thank you for the great work and tutorial, works like a charm!! Right, and in which program do I create a "*.sc2style" file? I use notepad. You can use a program specifically designed for XML files if you wanted. Any program you can modify a text document in will work. Updated downloadable map to reflect the changes made to part 1 (http://forums.sc2mapster.com/resources/tutorials/17969-dialogs-really-great-looking-dialogs-part-1/?page=2#p25). This also required a slight change to tutorial with regards to how the dialog height is calculated. Any thoughts on how to prevent the error message from occuring? Also your link to the list of sc2 font styles no longer works. HEy i make simple dialogues all the time, but i was wondering if i could replace plart 1 with just a normal dialog without constants and stuff? 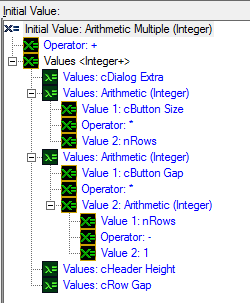 with just the 7 variables of 6 of them being dialog items and 1 being the dialog? Why not just use Set dialog title?